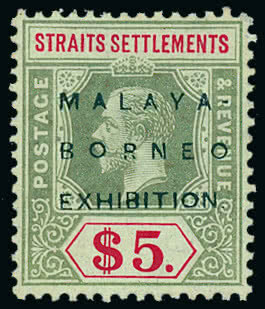 566 / Used / Malaysia: Straits Settlements: 1883-91 4c. 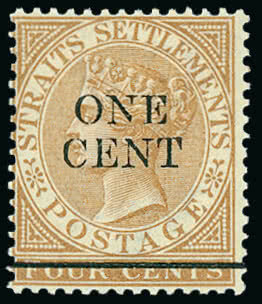 pale brown with watermark inverted fine used, also 1891 (Nov.) 30c. on 32c. 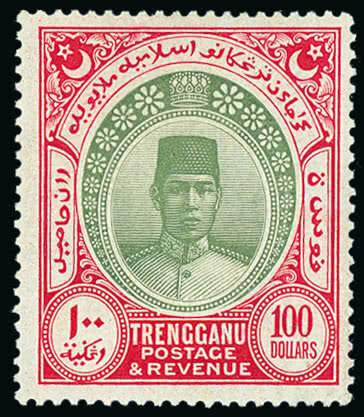 with watermark inverted and showing broken “S”, mint toned gum otherwise fine. 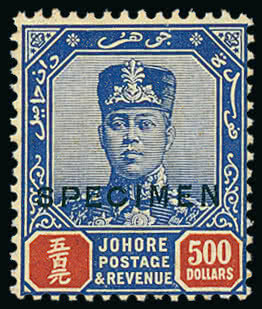 S.G. 64w, 87w. 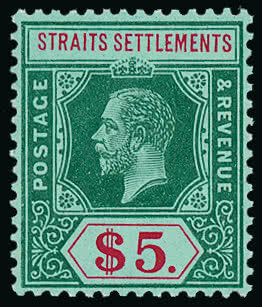 567 Malaysia: Straits Settlements: 1892 1c. on 4c. 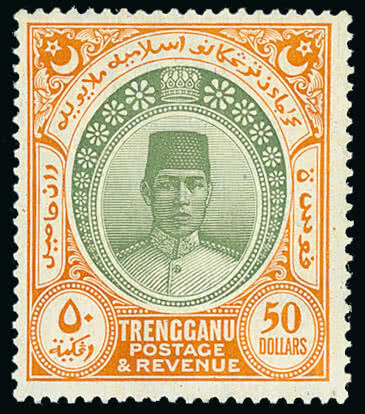 brown, fine mint. S.G. 89w, cat. £325. Photo. 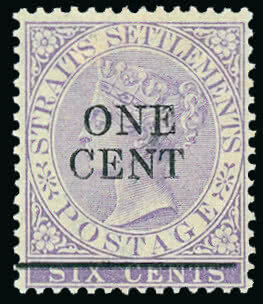 568 Unused Malaysia: Straits Settlements: 1892 1c. on 6c. lilac with watermark inverted, unused, part original gum, otherwise fine. S.G. 90w. Photo. 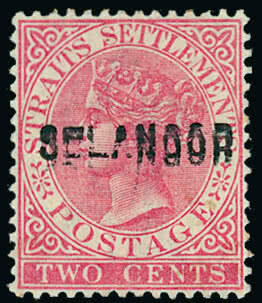 569 Unmounted Malaysia: Straits Settlements: 1912-23 Watermark Mult. 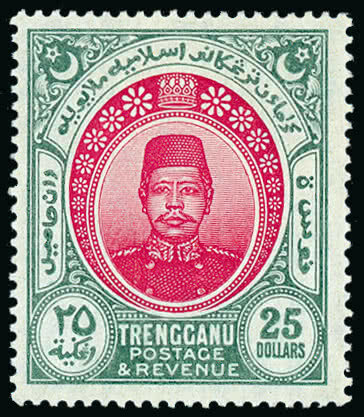 Crown CA $5 green and red on green, white back, fine and fresh unmounted mint. 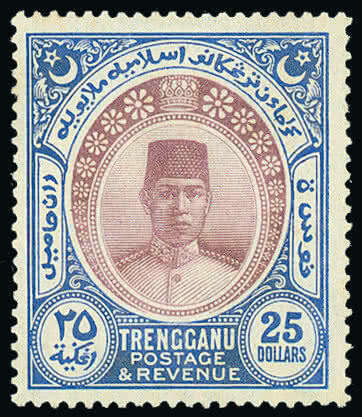 S.G. 212. 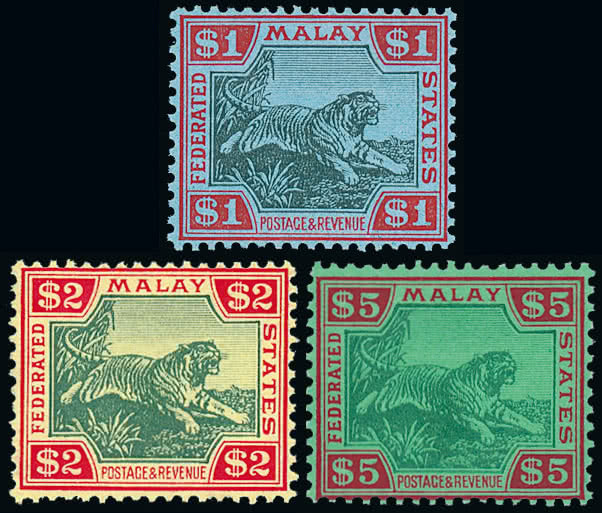 571 Malaysia: Federated Malay States: 1922-34 Watermark Mult. Script CA $1 black and red on blue, $2 green and red on yellow, $5 green and red on green, fine mint. 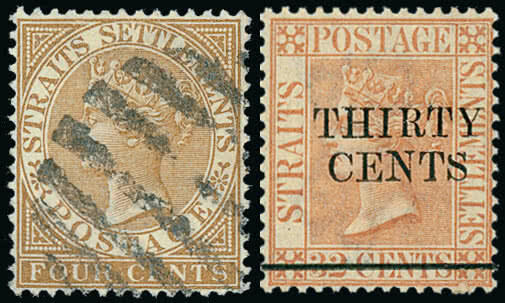 S.G. 77, 79, 81, cat. £452. Photo.